After the long delay, I’m sitting down to compile my final thoughts of the past week. I am so in awe over our Lord and what He is doing in Honduras. He has taken the nation back from the darkness that used to cover it, and I’m so excited to see what is to come. Saturday night we gathered at the Estadio Olimpico Metropolitano in San Pedro Sula. 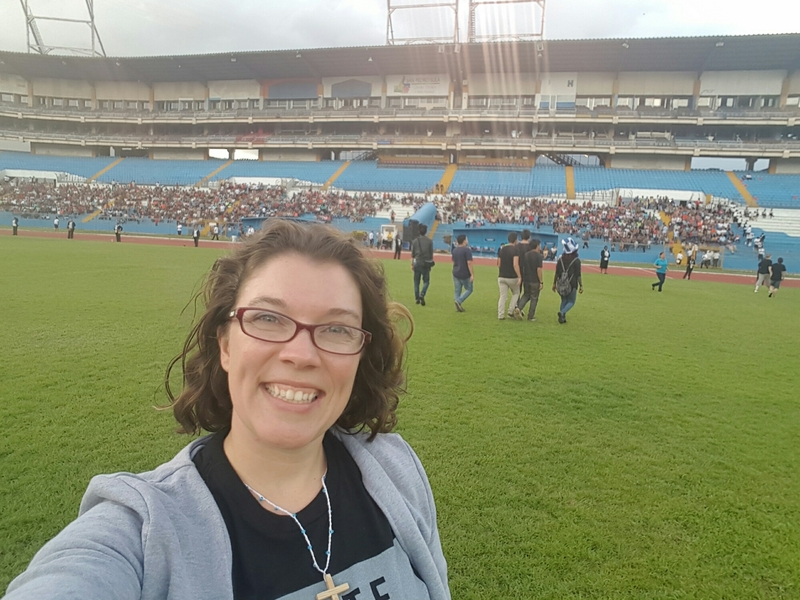 The stadium was one of 17 different stadiums across Honduras filled with Hondurans to declare that they are more. Their children are more. Their women are more. Their families are more. Their nation is more!! The speakers were unbelievable and included Dani Johnson (If you don’t know her, look her up. Her story is unbelievable!!) and the First Lady of Honduras, Ana Garcia de Hernandez. Words cannot express what happened in this single night. The night ended with some major tears as we had to say good bye to our sweet Honduran family (our translators). It was such a sweet night as we were able to pour into our translators and thank them for everything that they have done for us, as well as, pass the baton to them to continue running the race for God. Sunday was an early morning as we had to catch an early fight back to Miami. It was non-stop until we boarded the plane, thankfully our pilots were running a little late too. We were able to get off the ground and in the air just a few minutes later than scheduled. As I looked out the window and watched Honduras disappear into the clouds, I felt nothing but pride for the nation. I loved my time there, but I know that the nation is left in good and capable hands. I was ready to see my family. Monday was such a sweet family day. We spent it at Clearwater Beach and even got to share silly memories of changing in the beach bathrooms and using the hand dryers as hair dryers with my little girl. We laughed so hard. After the beach, we went and picked out the perfect outfits for the first day of school at the mall. The day finished with pizza, greek salad, and key lime pie. We drove home on Tuesday and today I get to go back to work. I’m not excited, but I know that God is going to continue His good work in me and show me how to share Him at work where quite often the darkness seems overwhelming. This past week God showed me that the light will always break through, even in the darkest of situations. The mission did not end when I stepped off the plane in Miami. It will continue every day I have breath in my lungs to declare that He is Lord.